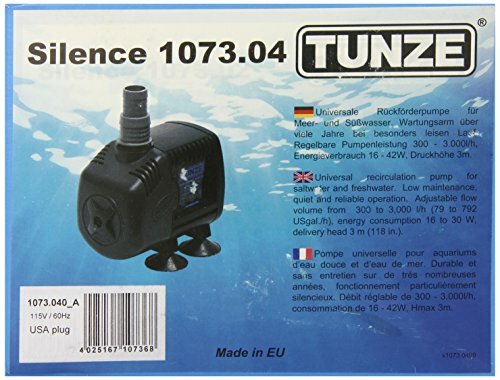 The compact and manageable TUNZE recirculation pumps cover many application scenarios which are common in today's market, for example, the filtration in aquariums, indoor fountains, design of stream courses and cascades in model construction as well as industrial applications. During the manufacturing of these pumps, a key emphasis is placed on the quality which will subsequently ensure a low-maintenance permanent operation for many years. The compact TUNZE recirculation pumps are built in accordance with the strictest international safety standards. Pumping volume: 80 to 790 US gal./energy consumption: 18 to 47 Pumping head: 118" Maximum, 3/4" NPT hose supports Voltage / frequency: 115 V / 60Hz.Cable length: 78.7 in. If you have any questions about this product by Tunze USA LLC, contact us by completing and submitting the form below. If you are looking for a specif part number, please include it with your message. Lee's 13210 10 Original Under Gravel Filter, 10" x 20"